At the most basic level, wheat grain is put through a mill, which produces a white-ish powder flour... Well, actually it's not quite that simple. First of all we need to distinguish between the different grains that can be made into flour: wheat of course, but also rye, barley, buckwheat, etc. So we use "flour" (pure and simple) to mean wheat flour, then talk of rye flour, barley flour, buckwheat flour, chestnut flour, etc. 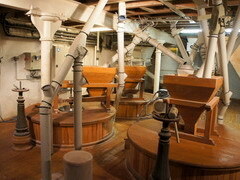 Then a further distinction is made according to how much of the outside of the grain (bran) is left in. 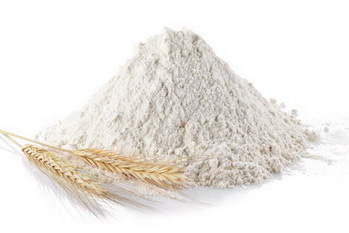 The purest, whitest flour (but not inevitably the best), contains only the inner part of the grain, the others contain a variable proportion of bran, right up to whole: wholemeal flour. A third distinction can be made according to the milling method. If nothing is indicated, it means that the flour has beeen made by industrial steel mills. If it's labelled "de meule" (stone-ground) it means that the flour has been ground using real millstones which give it a special flavour (and price, which is to be expected). In addition, "organic" quality ensures that flour is of high quality, without chemical products used on the grain, or added after milling. I'm making bread: use T55 minimum, ideally T65 up to T80. I'm making a speciality bread: use T80 and above. As soon as you need a flour that's a little out of the ordinary, it's difficult to find it in the local supermarket. The best way is to look in yellow pages to find flour-mills, then call to find out if they will supply to individual customers (See about that my best addresses page). This is ofen the case now because of the widespread use of bread-making machines. You may well be able to buy a range of several different flours at cheap prices, and if you're lucky you can chat with the miller, which is always a good and instructive experience. I would like to use a french recipe for pains a semoule et carottes, semoule being semolina. In the list of ingredients, however, there is no mention of 'semoule, the main ingredient is T65 flour. Are they the same flour? 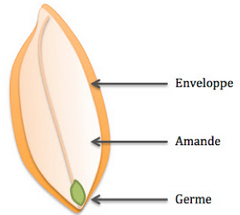 No they rae different: semoule or semolina is made of very smalls grains of hard wheat powder, and T65 is flour. Strange recipe without one of the main ingredient listed? I found your information about flour very useful. I live in France and am adjusting my recipes from using UK flour to French flour with varying results. I used T45 (all purpose) for short crust pastry for use in Quiches or Pies but found that the pastry had risen?? But the taste and texture excellent. I would appreciate your comments on this. I am also having difficulty english recipe cakes too. Is it possible to obtain the equivalent of Uk plain flour in France? Your advice would be appreciated. To prevent pastry from rise, you should pick it with a fork when in his mould, before furnish it or put in the oven. The steam made by the heat of the oven could go away by the small holes and so not make bubbles. If you plan to cook a crust alone (in French "à blanc") it's more efficient because pastry could not rise with the weight of lentils (or anything else you use) on top. Unfortunately I'm not easy with UK plain flour, but I guess it's a matter of "T", T45 seems to be a French exception, so you could try a T55 instead? Hi, yes you can, no problems. Can any one help me by providing me the Specifications of Flour T-80 "de meule" (stone-ground) flour. I live in France and am looking for a suitable flour to make pizzas. Any suggestions? Hi, many thanks for the speedy reply. Am using a T65 with a Paul Hollywood recipe for great white bread. Can get different types of flour here (incl T65) a few kilometres away straight from a working water mill. Will explore. Thanks again. No offence intended - just that I got the PH recipe before I found this great site. Have been looking at the traditionelle flours available here and have found ble noir. Any ideas? @marty : Be careful with blé noir, it's not really a flour for bread or cake, it's mostly use for special, salted, pancakes called "galettes". You can also use it in breads or cakes, but always in addition with classical flour and in small proportions (something like 20% of ble noir only). Many thanks for your comments jh. I guess it's T55, but I'm not sure, anyone else ? 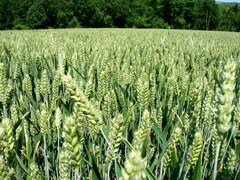 I leav in france i want to make wheat chapathis so plz tel me the flour name in french. Thanks a lot it is very helpful i have tried the french recipe of croissant but it did not go well since i took the cake flour by lake of knowlegde i did not know that T55 meant white bread flour... Thank you! You're welcome! By the way, the french croissants and chocolate rolls recipe on this site is going to be deeply modified, in September: more technical but also better results, like professional bakers (or almost). Does anyone know what the flour equivalent for the French "farine T150" is in Ireland and the UK? What is the UK equivilent of T45? There is mills everywhere in France, several in each departments, you should look into yellow pages. I live in US, I have several flours at my home but I can't find the T symbol on the package. But some of them have more protein then others. Do you know how to figure out the T symbol by checking how much proteins flour has? I was hoping to make madeleines, I'm in the US, but can't find T45 flour. I'm thinking cake flour is the american equivalent? But it seems a bit different feel? Suggestions? For madeleines, cake flour will be OK.
what is the 00 flour equivalent too ? What flour should I use to make authentic crepes? We have a wonderful book - though very technical and expensive - but husband now makes the most amazing bread. We use T45 for pastries and T55 for bread and pizza dough. We found the T65 too strong. If you have the patience it is worth a read/browse - "The Taste of Bread" by Prof Raymond Calvel. There is also reference to American flours. I hv discovered that 98% of all USA flour has been sprayed with MONSANTO ROUND UP chemicals, right before harvesting, leading to a slightly larger yield of wheat, does France do the same with its Wheat at harvest time? No, many flours in France are organics, or another quality label (like "label rouge") which ensures that there is no pesticides on the wheat before it goes to the mill. 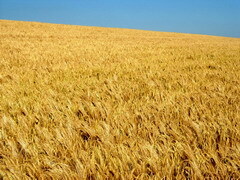 Hello, I have T55 wheat floor, Can I make cake out of it? Yes you can, no problem at all. Hello, I would like to make my own pasta here in France, which flour type should I use? In the UK we would use 00. I am happy to make white and brown / whole grain pasta. Apologies if this has already been answered, I read through the threads but couldn’t find the information. Hello, I think the best choice for pasta is to use a french T55 or T65 (you have here a recipe of fresh pasta dough). But if you are happy with a bit "rough" flours you can go higher to T80, I'm afraid that beyond that value it will make a curious, but probably tasty and coloured, pasta.